In South Africa we use English alphabetical measuring system. Inside ring diameter is displayed next to the finer/ring size (capital letter). For additional conversions and details on free re-sizing please refer to ‘Your Ring Size’ page. All precious metals are sourced from an accredited metal concentrator. This ensures correct legal composition and metal stability. White gold alloys are rhodium plated for additional shine and durability. 9K white gold is least expensive but it requires most maintenance. Yellow gold alloys become darker in colour with higher gold content. 22K yellow gold is darkest but also the softest. Platinum and Palladium are part of the same group of metals, with platinum being the hardest, most durable and most expensive. 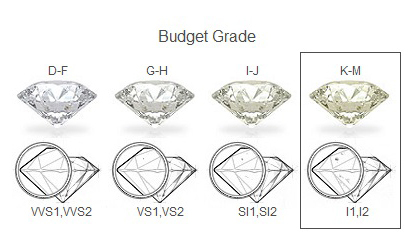 Budget grade diamonds (colours K-M and clarities I1-I2) have a light yellow tint, and are slightly more included than standard commercial stones. Blemishes may be visible to the naked eye especially on larger diamonds. This quality allows for 20%-30% discount off the premium grade. Premium grade diamonds (colours I-J and clarities SI1-SI2) are most popular standard commercial stones sold by jewellers in South Africa today. These diamonds offer very good value for money as they are considered white and eye-clean. Specialised equipment is needed to notice any inclusions, especially on smaller stones (under 1 carat). Premium grade is our standard online offering. 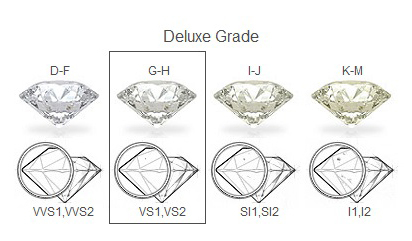 Deluxe grade diamonds (colours G-H and clarities VS1-VS2) are the ‘high-end’ of commercial stones. They are top white (or near colourless) and have no visible blemishes, only qualified gemmologists can identify inclusions when using magnifying equipment. Deluxe grade is our standard online offering. 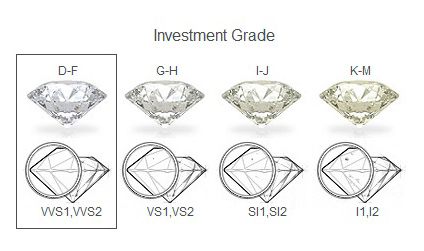 Investment grade diamonds (colours D-F and clarities VVS1-VVS2) are colourless and unpolluted, they are almost pure (ultimate purity is reached at IF clarity - Internally Flawless). These diamonds are rare and most expensive, but they do offer the best return for the savvy investors. Majority of stones in this quality are kept loose, not jewellery-mounted. For availability and quotes please call 0861998888 or enquire by email. A diamond's weight is measured in what is known as a 'carat', which is a small unit of measurement equal to 200 milligrams. Carat is not a measure of a diamond's size, since cutting a diamond to different proportions can affect its weight. Above diagram shows some carat weights relative to their diameter sizes. Pictured sizes are approximations. 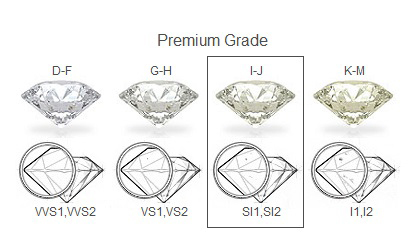 Indicated diamond characteristics are of the minimum specification that will be used for your order. We undertake to upgrade all diamonds at no additional cost to you, should above specs not be available. 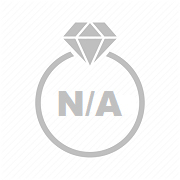 For example, if you select a 0.50ct diamond, we might upgrade it to 0.51ct or more. We will never downgrade on diamond quality. Today's price for this design and all selected components is linked to current indicators. It is periodically updated. You can keep track of the price changes by subscribing to a free notification email - 'Price Change Alert'. Investment grade diamonds (colours D-F and clarities VVS1-VVS2) are colourless and unpolluted, they are almost pure (ultimate purity is reached at IF clarity - Internally Flawless). These diamonds are rare and most expensive, but they do offer the best return for the savvy investors. Majority of stones in this quality are kept loose, not jewellery-mounted. Please note that we do stock investment grade however it is not part of our standard online offering, for availability and quotes please enquire by email. Grading certificates are diamond’s fingerprints, they describe the four C’s as well as all proportions and measurements. 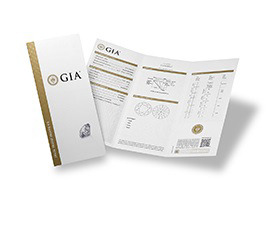 Diamond grading report will be included with your order – for all diamonds of 0.30ct and above. Please note that we only offer certificates from SA and world accredited labs such as GIA, EGL, DIA or IDL. Cross-grade diamonds are a combination of upper colours with lower clarities, and vice versa. These are ideal for those preferring higher diamond colour over its clarity, or better clarity over the colour. Such combinations offer good value but are not always popular as sacrifice must be made on at least one of these qualities. For stock availability please contactus us by email. 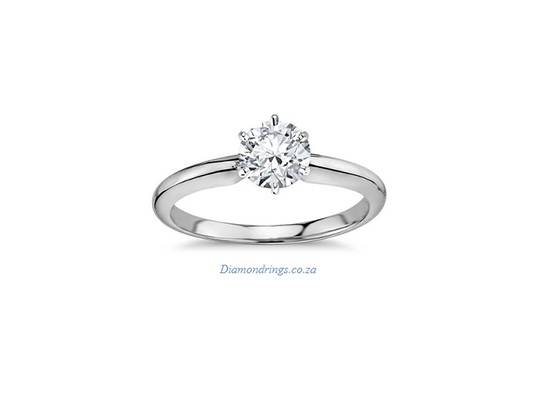 Side diamonds (also referred to as smalls) are accredited on each item’s product details page. They are calibrated and spec-matched with the selected main diamond. Smalls are always included in the total purchase price and are part of the total crat weight of the item (TCW). Stones under 0.30ct are verified by the gemmologists but are not certified. 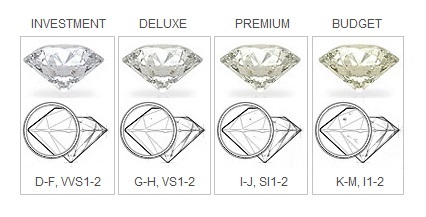 Each design is pictured with a specific main diamond size. Please expect slight variation in proportion should you select a smaller (or larger) diamond than the one pictured. Variation to overall design proportion can also be expected for ring sizes under 'J' or over 'S'. 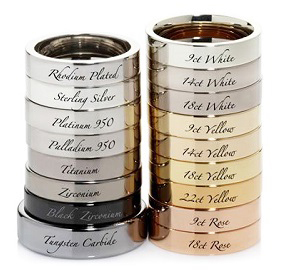 Each design can be ordered in three gold colours like white, yellow and pink see 'Select Your Metal & Colour'. Two-tone rings are pictured as they are. Displayed computer colours may differ from actual colour of finished product. Delivery or completion timeline comprises of business days, and is only an estimate. Exact completion date will depend on several factors such as receipt of proof of payment, banking clearance period or availability of all requested components. Deliveries scheduled for weekends or public holidays will be couriered on the next available business day. Selecting diamond quality can be a daunting task. There are hundreds of possible colour and clarity combinations, all cross-referenced with numerous RAP pricing tables. We have managed to simplify the selection process by introducing four distinct quality grades (Budget, Premium, Deluxe and Investment grade), each displaying equivalent price and comparable characteristic. For more information please click on ‘i’ icons below, next to each quality grade.